Trevor Lawrence is a 6’6”, 215-pound freshman from Cartersville, Georgia, and he went from a well-known star in the south to a household name thanks to his brilliant play in the College Football Playoff. In 56 games played as the starting varsity QB at Cartersville High School, Trevor threw for a total of 13,902 passing yards with 161 touchdowns and only 21 interceptions, completing 846 of 1,335 passes. Lawrence was ranked the No.1 high school player in the nation, regardless of position. He played in the U.S. Army All-American Game, where he earned the “U.S. Army Player-of-the-Year” Award, was Georgia’s Gatorade Player-of-the-Year and was the USA Today National Offensive Player-of-the-Year. Trevor even broke Georgia’s state records for passing yards and touchdowns, which were previously held by his Clemson predecessor, Deshaun Watson. Trevor was recruited and offered by 23 schools, including Alabama, Georgia, Florida, LSU, Oklahoma and Michigan. Schools, coaches, players and fans all across the country had been crossing their fingers up until December 15th, 2016. This was the day that the #1 player in the nation, Trevor Lawrence, committed to play football at Clemson University. While Clemson coaches, players and fans could let out a breath of relief, it would not be long before they had to hold their breath again. The quarterback battle prior to the 2018 season was something the coaches and players may not have wanted to talk about but everybody knew had to be discussed. Kelly Bryant took over as Clemson’s quarterback for the 2017 season after Deshaun Watson was drafted in the first round by the Houston Texans. 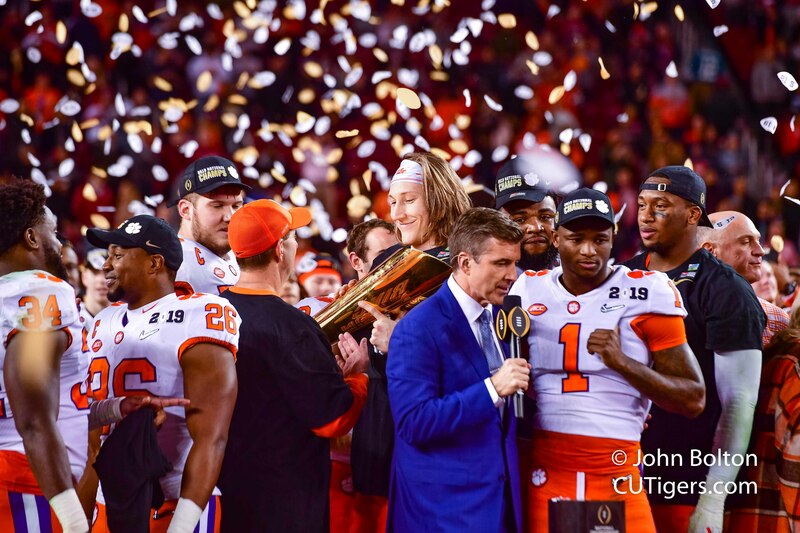 As a first-year starter, Kelly Bryant led Clemson to a third straight ACC Title and College Football Playoff with a 12-2 record. To be fair, Bryant was really 12-1 because he started the Syracuse game injured and didn’t even finish the first half. During the 2018 Orange and White Game, Trevor and Kelly were on opposing teams. While Kelly went 8-15 with only 35 yards, Trevor went 11-16 with 122 yards and 1 touchdown. The vast differences and skill set between the performance of the two quarterbacks was noticeable. 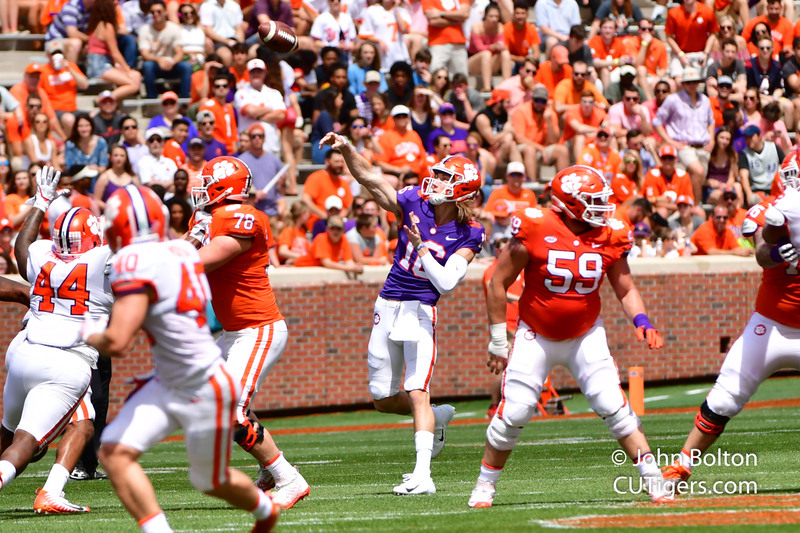 The Clemson fan base went back to holding its breath after the spring game up until September 1st to see who would be named the starter against Furman. 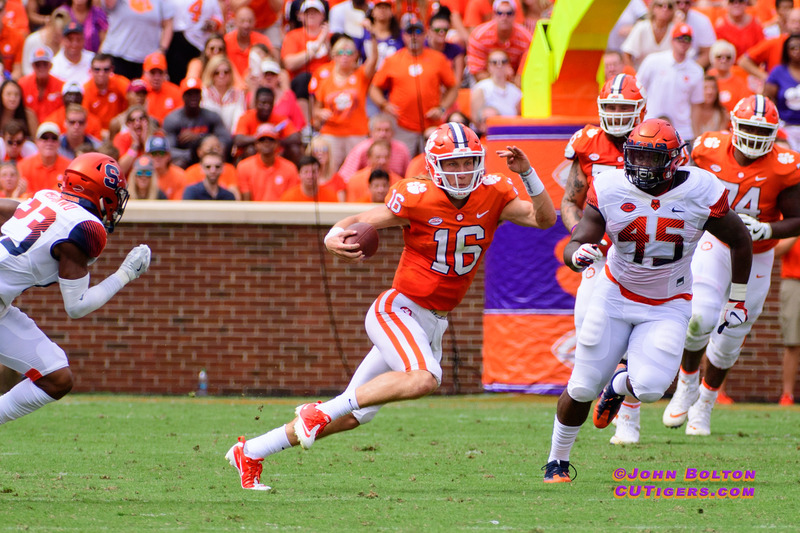 Kelly Bryant was designated as the starter for the season opener, and while everyone could finally let out their long breath of fresh air, knowing that the decision was deserved and fair, they were all also wondering how long this would continue. Four weeks. Kelly Bryant remained the starting QB on the depth chart for 4 weeks. 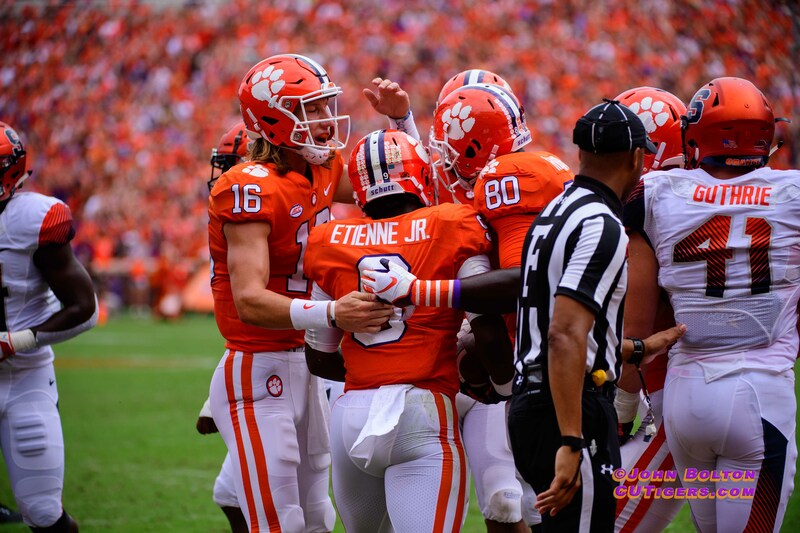 The Monday before the team played Syracuse – the Tigers’ only regular season loss of 2017 – Trevor Lawrence was named the starting QB, supplanting Kelly Bryant, who had a 16-1 record as the starter. A few days later, Kelly Bryant announced his decision to transfer and use his last year of eligibility elsewhere. With the weight of the world (and all the eyes in it) on his shoulders, Trevor Lawrence knew it was his time to step up and be a big-time play-maker for the rest of the season. Ironically, Trevor’s debut as starter would be short-lived. He left the first quarter with a neck injury, and for the second straight year, the Tigers’ starting quarterback wouldn’t make it to halftime against Syracuse. 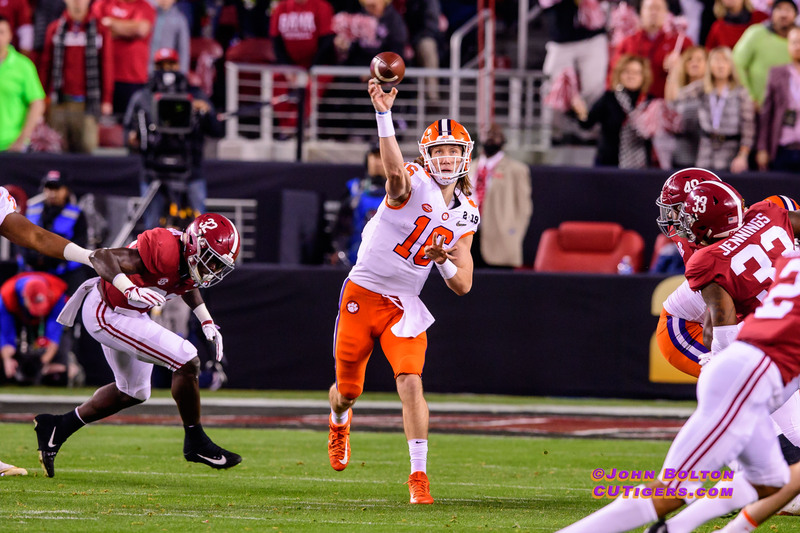 Thankfully, the originally third-string (now second-string) quarterback, Chase Brice, was ready for his number to be called and performed in the clutch for a thrilling come-from-behind win that will forever be remembered by Clemson Nation. After Trevor was named the starting QB, he took his opportunity and—occasionally literally—ran with it. In the Tigers’ historic 15-0 season, Trevor threw for 30 touchdowns, 3,280 yards and completed 259 out of 397 passes with only 4 interceptions. He finished 2nd in the ACC total passing yards and broke Deshaun Watson’s Clemson records for passing yards and touchdowns by a freshman. In addition to becoming just the second true freshman QB in history to start and win a National Championship, Trevor earned an abundance of awards and recognition throughout the year, including: Freshman All-American Team, Touchdown Club of Columbus Archie Griffin Award, ACC Rookie of the Year, Second Team All-ACC, Rivals’ All-Bowl Team, Offensive MVP of the Cotton Bowl, and Offensive MVP of the National Championship. From the outside looking in, the biggest thing that stands out about Trevor Lawrence—aside from his hair—is what a great athlete he is and how effortlessly he makes it seem. But for the coaches, players and people who are around him the most, what really stands out the most about Trevor is how gracefully and confidently he carries himself without coming across as cocky or arrogant. Anytime his teammates were asked to describe him, the most common adjectives are: quiet, laid-back, calm, “a cool dude,” and that he never gets worked up. His teammates even laughed and said that in practice when he gets sacked or throws an interception, Trevor pops back up and congratulates the defender on his play. Trevor’s favorite player growing up was former Tennessee and future NFL Hall of Fame QB Peyton Manning. Lawrence even wears #16 because of Manning. Coincidentally, Trevor Lawrence is often said to be the best NFL quarterback prospect since Peyton Manning. Trevor said he liked how Peyton Manning carried himself, and I don’t know if Trevor knows it or not yet, but one day kids will grow up and say the same thing about him. Despite all the notoriety of winning a National Championship as a true freshman, Trevor Lawrence’s humble persona still remains unfettered. In fact, during the post-game press conference after beating Alabama, Trevor’s youthful innocence was exhibited when he asked if he could take his name plate as a souvenir. When asked how he is so laid back in the midst of everything that has happened this season, Trevor casually said, “Football’s important to me obviously, but it’s not my life. It’s not the biggest thing in my life I would say – my faith is. That just comes from knowing who I am outside of that. I just know that no matter how big the situation is, it’s not going to define me. I put my identity in who Christ thinks I am, and who I know that He says I am, so at the end of the day, it doesn’t really matter what other people think of me.” These words of wisdom beyond his age will go down in history to the Clemson faithful, right alongside the true freshman who has already started his historical journey as a Tiger.